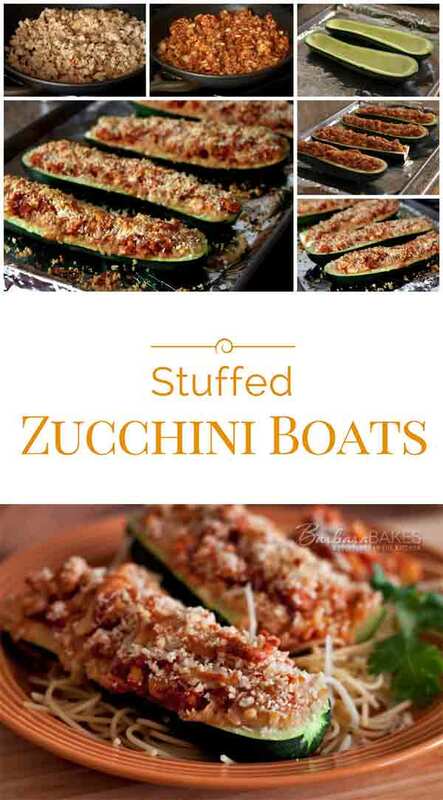 Zucchini cut in half and hollowed out to create “boats” then filled with a spicy, tomato, sausage filling, topped with panko breadcrumbs and Parmesan cheese, and baked until it’s tender and crispy, golden brown on top. My son came home from work the other day and said he was telling his co-workers about my stuffed zucchini recipe, but he couldn’t find it on the blog. I told him that’s because it’s not on the blog. It’s one of those dinners that I don’t cook from a recipe. My daughter said she had looked for it on the blog too. So I decided to put it on the menu, wrote down the ingredients, measured the amounts, and took some step by step photos as I was putting it together so that I could share it with them and you on the blog. The recipe is really easy and it’s the perfect way to use those medium size zucchini that you wish you’d picked a day or two earlier. I love Harmons Grocery store’s chicken sausage, but feel free to use your favorite ground sausage. I wouldn’t substitute ground beef unless you spiced it up a bit. The recipe makes more filling that you can fit in the zucchini, so I just serve it on the side. My daughter likes to serve it with spaghetti too, but if you’re watching your carbs, I’m happy eating it as a one dish meal. Cut zucchini in half lengthwise and using a spoon, scoop out flesh, leaving 1/2-in. shells. Chop the scooped out flesh of the zucchini in small pieces and set aside. Brown sausage in a large sauté pan over medium high heat. Add onion and cook until meat is no longer pink and onion is tender. Add garlic and cook for another minute. If necessary, drain any excess fat. Stir in tomatoes, basil, and chopped zucchini. Add salt and pepper to taste. In a small bowl, combine breadcrumbs and parmesan cheese. Divide the sausage mixture between the shells (boats), and then top with breadcrumb mixture. 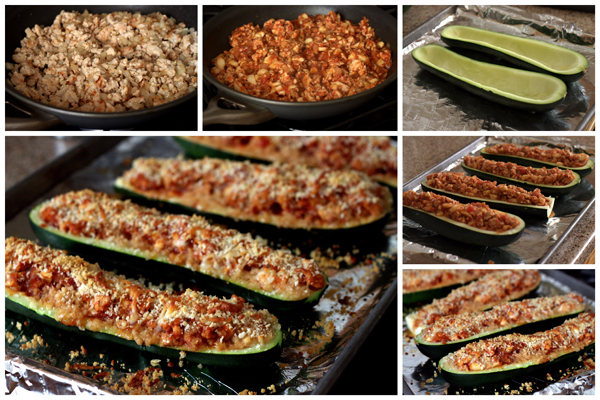 Bake for 20-25 minutes or until zucchini is tender and top is golden brown. Every now and then I think back to the stuffed zucchini boats a friend of mine made and served me way back when we lived in Italy and I loved them. I have never made them but they are the best dinner! Thanks for sharing and I’ll definitely be making them! 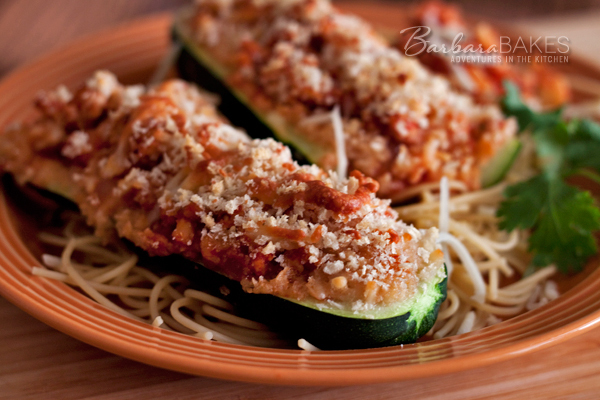 Just finished eating supper and we had the zucchini boats…Delicious!! Definitely a keeper!! Thanks!